We just arrived back in (sunny!) Scotland from stunning, stately Lucca. And I have the strap lines and piles of laundry to prove it. Lucca, a smallish fortified Italian town a short drive from Pisa, is a place I first visited a few years ago while on a cooking course. If you have ever been to Lucca you will know why I introduced my family to its scenic charms, and have been returning as often as is permissible by our bank account. It is simply exquisite. Hemmed in by the granite walls that ring the old town are centuries’ smoothed cobbled streets bisecting soaring medieval buildings, cafes that spill out onto plane tree lined piazzas, stylish clothing and leather goods shops, more churches than you can shake a hymnal at and, everywhere, bicycles. I’ve never seen so many bicycles. The narrow streets are thronged with wobbly-wheeled tourists (us), dashing (in all senses of the word) white-shirted businessmen, lithe-limbed and be-skirted women, their baskets and panniers brimming with fancy shopping bags, vegetables and the occasional small dog. We even held back a giggle at the sight of a gaggle of nuns free-wheeling down a hill, habits at full mast, feet off the pedals. It’s that kind of place: joyful. I had hoped to share lots of photos with you of our short but sweet – and savoury! – adventure, but alas, my camera had other ideas. A few photos from day one and a couple of phone ones (see right; wish I knew how to make them bigger) but otherwise, blursville. So, although I am lacking in piccies for you, I can offer a few descriptive recommendations. 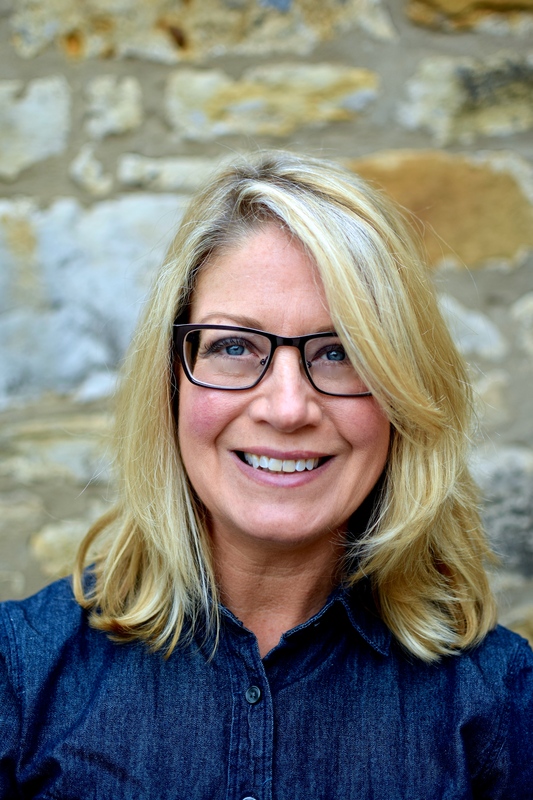 I am not normally a travelblog, so those of you here for the recipe please skip on down, but otherwise a short interlude of how we at ‘villa food to glow’ like to spend our Tuscan time – eating! 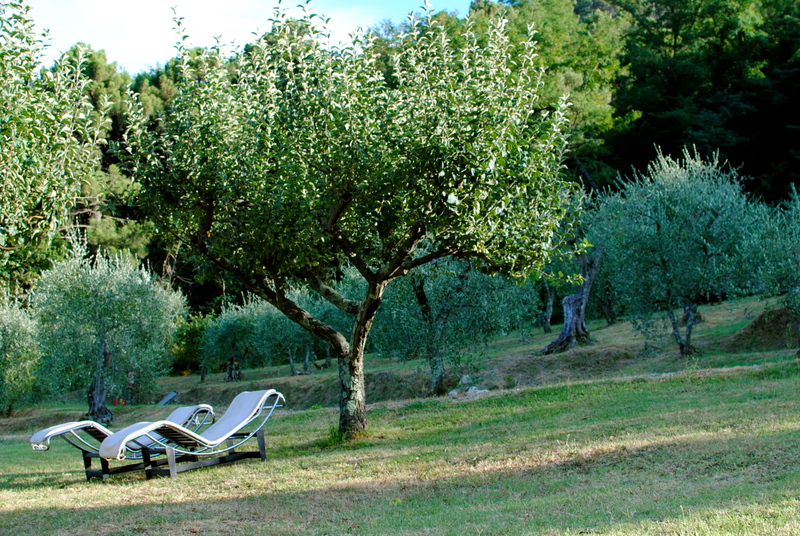 Our hotel: A former convent, Hotel Villa Volpi offers a spacious and serene break amongst the vine and grove thicketed hills outside of of Lucca – some of which is their 20 hectare organic vineyard and olive grove. Reached by a ribbon of smooth road, Hotel Villa Volpi overlooks a part of Tuscany that looks ready to pop with ripeness: fields of rustling flaxen-tressed corn, laden vines, trees heavy with luscious rose and green-hued pears, plums and apples, huge sunset cloaked apricots and, of course, the silvery shimmer of olive trees. The breakfast buffet gives all a chance to fill up on bowls of just-picked fruits, eaten with homemade bread, cheeses and other goodies on precipitously placed outside tables – heavenly. I wouldn’t hugely recommend the evening meals there – the restaurant, as are most hotel restaurants, is run by an outside group – a bit fried and the service a bit harried. But with so many wonderful places within easy reach it really doesn’t matter. For a great lunch, grab some delicious bits and bobs from Il Forno (literally, ‘the oven’) down the road – they grind their own flour. Or, there are some lovely hot dishes to go from the nearby supermarket, Esselunga. 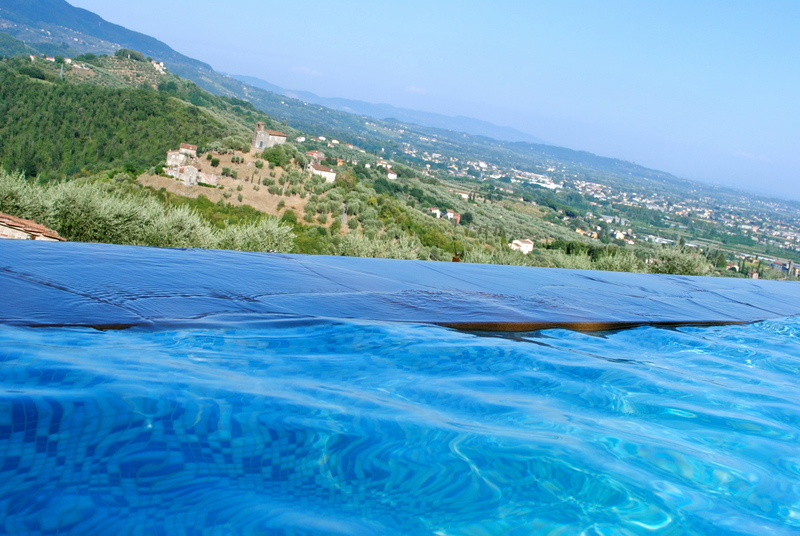 And, apart from a bit of multilingual banter around the pool, all is silent at Hotel Villa Volpi. Our visual highlight was an evening hour sitting up above the hotel, drinking Prosecco by the star-lit infinity pool, the lights of Lucca winking and glinting far below. Food: For a beautiful meal on a quiet piazza, head for Ristorante Giglio. We strolled up at an early 7.30 (to get back for the Olympics) and by 8.30 the inside and outside spaces were packed with tourists and immaculately turned out locals. Miss R had the osso buco con piselli (veal shank with peas) and a starter of pappardelle with wild boar ragu (see below), I had roasted lamb with the best chard I have ever had, and Mr A had stewed wild boar with bitter olives and polenta. We were in the clean plate club that night – delicious. Every dish that whisked past us looked and smelled fantastic. Not too pricey either, and with a free glass of rather nice Prosecco to welcome guests. Do you detect a theme developing? The most authentic Tuscan food experience can be had at our favourite dining spot, Antica Locanda di Sesto. Dating back as a restaurant to 1368, this revered family-run eatery serves from-scratch local specialities such as baked kid with homegrown roasted vegetables, gorgonzola gnocchi, farinata with black cabbage, unbelievable lasagne and aubergine parmigiana, stuffed veal breast, various roasted meats (they are big on meats here) with appropriate sides, wild boar stew, pecorino ravioli with walnuts and pears. Portions are huge by European standards so hold back on the magically refilling bread basket (homemade of course), but save room for baked fruits in wine and spices or creamy tiramisu. And more free Prosecco! Don’t forget to buy a bottle or two of their estate’s wine and olive oil. We successfully lugged back three bottles of their herbal not too nippy olive oil wrapped in beach towels, along with a freebie wine given to us by the exceptionally helpful and kind head-waiter/owner’s son. I think we may now qualify as regulars. I could go on and on about this special place but I will leave it by saying that the service is probably the best I have ever experienced as a tourist, so it’s not just about the history, the medieval setting or the food. If you are anywhere nearby you really must visit Antica Locanda di Sesto. Reservations a must. 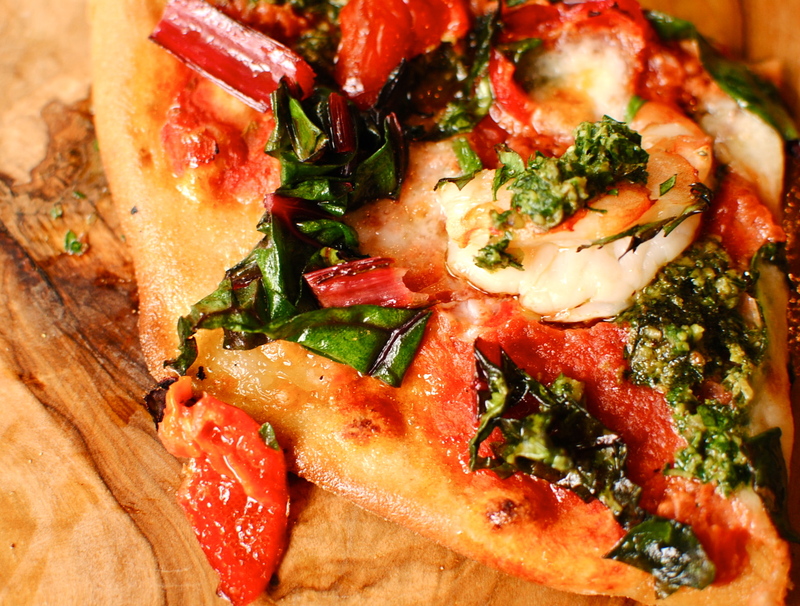 In the heart of the city find fantastic pizzas and unbelievably tasty and cheap lunchtime specials at Rusticanella 2. This smallish, wood-panelled space with outdoor seating is a real find: feather-light pizzas and calzones, local dishes such as stewed tripe in the Florentine style (Mr A had this – loved it), meatballs with peas, creamed salt cod with chickpeas, and lots of pastas and hearty regional soups. All with free homemade foccacia (no free Prosecco ) and the friendliest waitress in the city walls. This is a regular stop for us in Lucca, although Lucca is rather known for its high standard of food so no place would be a complete gamble. So that’s me finished with my highlights of edible Lucca. So on with the recipe, one I don’t think would stack up in Lucca but might be perfectly serviceable in the comfort of your own home. More tomatoes this week, but as a fresh, crimson backdrop for juicy plump prawns, sweet hot Peppadews and snow-white mozzarella. Not forgetting the unexpectedly punchy parsley and walnut pesto, as featured in last week’s Roasted (Nearly) Nicoise Salad with Burrata. Today’s Italian-inspired recipe gives you enough sauce and pesto for double the amount of pizzas, or with leftovers for a super-quick and nourishing pasta or gnocchi dish later in the week. I can imagine both would also go well atop and alongside chicken, or in an Italian take on nachos – a tumble of polenta chips, a colourful jumble of the two sauces, plus a grating of scamorzi affumicate (smoked mozzarella to you and me). Have I just invented something? I am popping this recipe over to Ren of Fabulicious Food for her Simple and In Season and Sporting Snacks recipe link ups. Go visit and see what else is on offer. Where’s your favourite foodie holiday destination? Can you recommend your favourite restaurant, cafe or beach bar? What about a must-try dish? Please let me – us – know! If you like big flavours, this pizza is for you. I’ve given a link to my parsley and walnut pesto recipe, but of course use another recipe if you like. And if you can’t get hold of Peppadews just use some roasted pepper strips that you’ve doused in balsamic vinegar or similar: the sweet-sour thing is a winner here. Seafood-phobes and veggies just ditch the prawns and add more cheese. Dough: 240g white spelt flour or plain/AP flour; 1 heaped tsp fast-action yeast (the kind for bread machines and handbaking); 150 ml hand-hot water; 1 tsp runny honey; 1 tbsp olive oil; ½ tsp fine salt ** and here is a gluten-free pizza dough that I have not tried, but comes from Amber at The Tasty Alternative, a reliable source** It is notoriously tricky to make gluten free dough but her technique and video look the business. 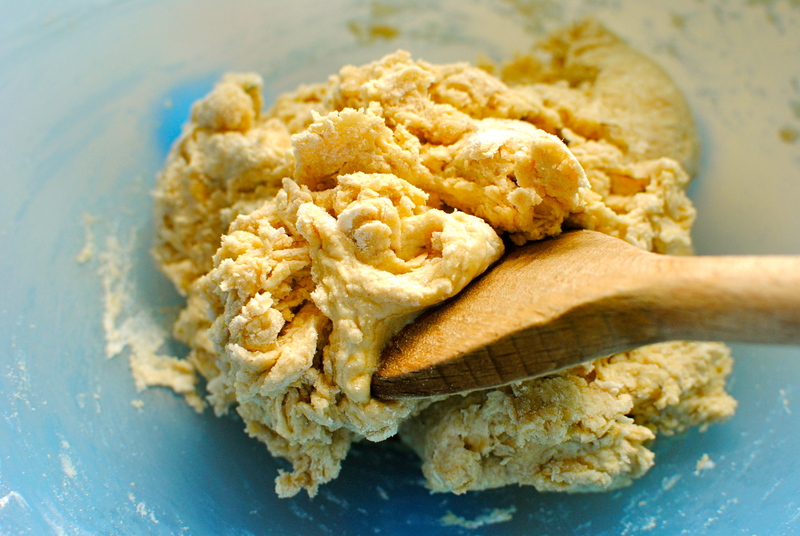 First of all make the dough up by sifting the flour into a large, wide bowl and stirring in the yeast; make a well in the middle. In a separate bowl or jug whisk together the water, honey, oil and salt and pour this into the flour well. Holding the bowl with one hand, make a claw of your other hand and stir the dough until it comes together. It will be a bit tacky and pull away in strands. If it’s actually sticky, add a teaspoon or two more of flour. Now you can either knead the dough in the bowl until it becomes smooth and springy, or you can plop it out onto a floured surface and knead until the same. Pop the kneaded dough into a large lightly oiled bowl (the same bowl but cleaned up), cover with a cloth or clingfilm and leave in a warm place until it has doubled in size – about an hour. While the dough is doing its thing pop the sauce tomato sauce ingredients into a food processor and pulse until you have a chunky sauce. If it seems a bit watery – and this will depend on your tomatoes – you may want to drain it a bit in a sieve. If you haven’t already made the pesto from last week, make this up as per the link above, or use your favourite fresh pesto. I really like this punchy parsley one though so I hope you give it a go. 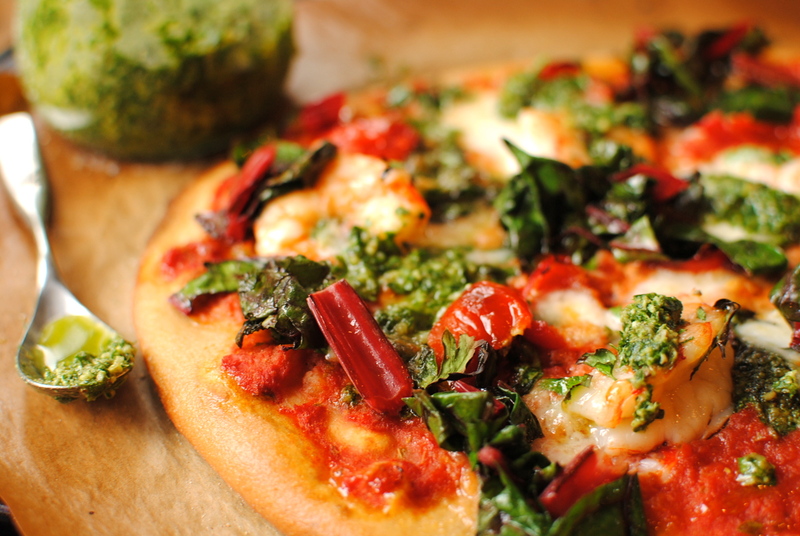 When the dough has doubled in size heat your oven to 2250C/450F, along with a pizza stone or sturdy baking tray. Or two, if making them as individuals. Using your fingers gently press the air out of the dough. I don’t think it’s necessary to be violent and pummel it, but carry on if you need to vent a bit. Knead the dough a few times then roll out into one large roundish pizza shape, or – my preference – two rounds. As thin as you dare. 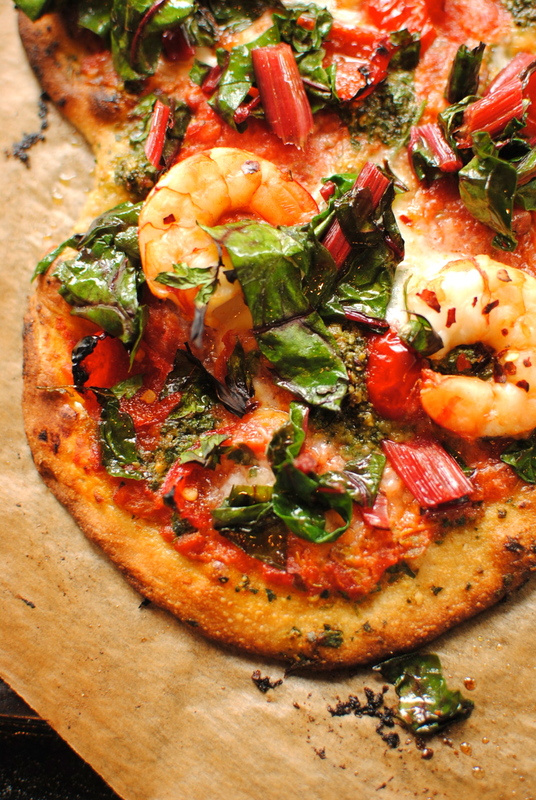 I do this on polenta as it makes it easier to transfer onto baking parchment and it gives the pizza a great crispness. Carefully lift the dough onto a sheet of baking parchment, then spread two tablespoons of tomato sauce onto each round, leaving a centimetre ‘frame’ all around. 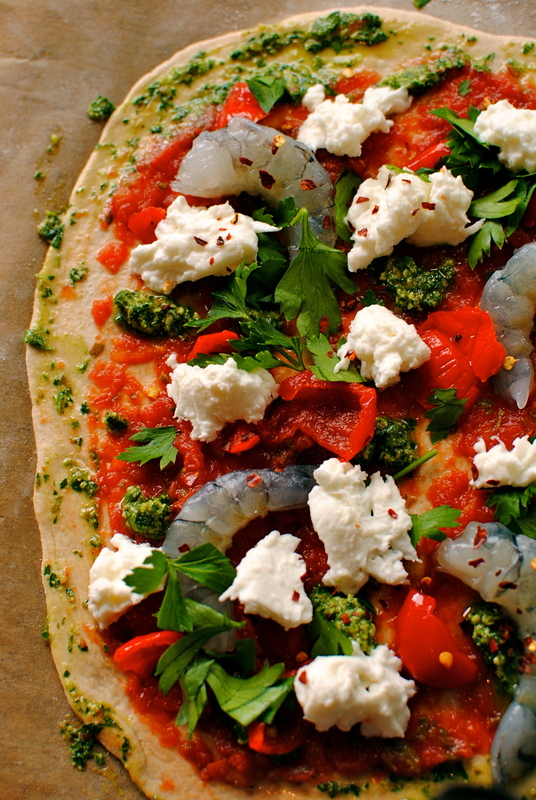 Fleck on about one tablespoon of pesto evenly over the pizza, then scatter over the torn peppers, the butterflied prawns and mozzarella. No need to cook the prawns first but you may want to rub them with a little oil. Now slide the dressed pizzas onto the trays or stones and bake for about 15 minutes, until bubbling and the edges are golden. As soon as they are done drizzle some olive oil or spread some more pesto around the unadorned frames; drape over the cooked chard, if using, as well as some extra parsley and some chilli flakes, if you like. I hope this doesn’t sound too much of a faff because, if you have the time, and some great tunes blaring out, it’s really fun to make and tastes SO much better than takeaway or supermarket pizza. Want more pizza ideas? Try my Cauliflower and Almond Crust Pizza with Fresh Sauce and Greens or maybe Tuna and Crème Fraiche Pizza (on of my first posts, so forgive the photos). Wasn’t it London? if you are tired of London you are tired of life!! Either way , that looks delicious! Hi there. That’s why I said I was mangling the quote! Well mangled. And thanks for thinking the ‘pizza looks delicious. i wished i had the time and patience to make a pizza dough. i used to be crazy about my homemade spelt pizza and kept some dough in the freezer, for “fast” pizzas. i havent made one in ages, just takes too long and i am caught up with work that i want my dinner to be ready when getting home. how long did take to make the dough? Ooh, about eight minutes, then proving time. What is a good idea – if one is organised – is to make it (or any pizza dough, including your own recipe) the night before and pop it in the fridge for a slow rise. It actually tastes better that way! I love making dough. Very tactile and therapeutic, but only when you are in the mood. *Sigh*. 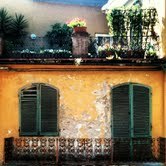 You have transported me (and my head cold) out of a raining and bitter winter’s morning to Italy, albeit briefly. A lovely post, Kellie, thanks for sharing! Aww Lizzy, hope you feel better very soon. I’m glad my windbag of a travel blog cheered you up a bit. Or did I just make you wistful? I will be following your blog! I like making my own pizza dough but will try some of your suggestions. I am inspired. Your trip sounds lovely. Had a great time in Todi nr Perugia a few years ago, similarly hemmed in and amazing food. Although there it was free Bellini’s oddly. Pizza looks great. 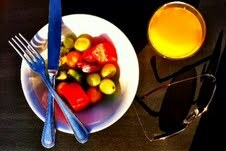 Peppadew peppers are fantastic, especially if you have arthritis like me as there is no chopping involved. Now if you can just come up with a no rolling pizza dough I’ll be permanently indebted! Kate, my cauliflower-almond crust could be gently patted out, or pay a small child in pizza to do the rolling! Thanks Lori but I’d really like prawns with most anything! And chili flakes too. Wow. Wow. Wow. Amazing photos, amazing food, amazing all of it. This looks fantastic! Great crust …. the chard is a nice choice too! Lucca sounds beautiful – thanks for showing it to us despite the lack of pictures. 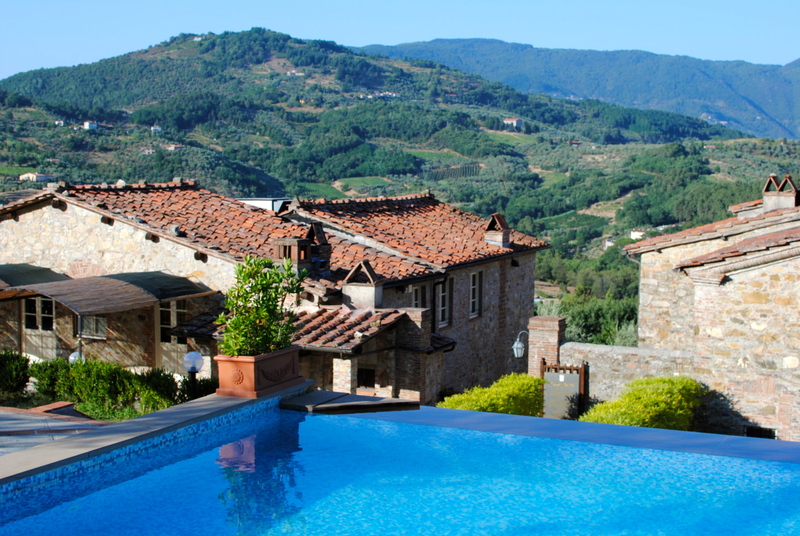 Am particularly thrilled to have a good excuse to return to Tuscany (not that I really needed another one). The pizza looks amazing, and even before you mentioned it, I had no doubt that it tastes MUCH better than takeaway or supermarket pizza. Am sure I was not alone there. What a luscious vacation! A feast for the senses is a perfect summer escape. The pizza is inspired! 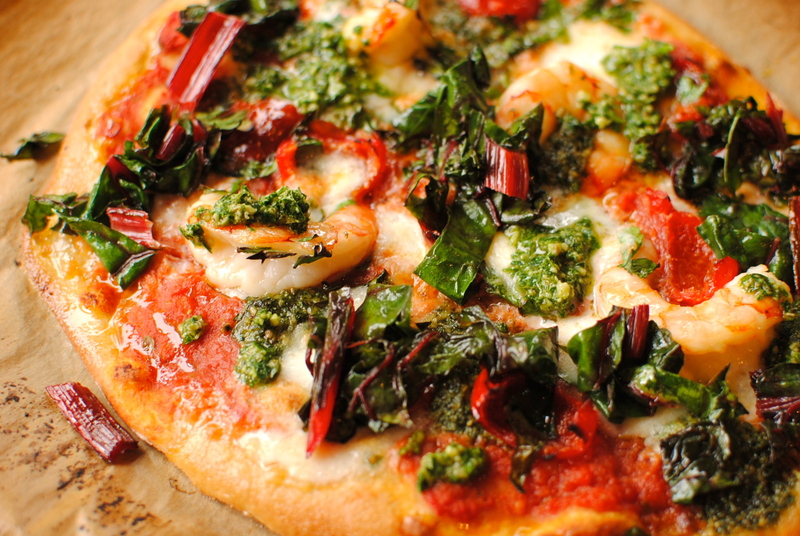 Prawns and pesto atop a sultry warm crust is a most scrumptious dinner. 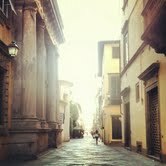 Like I said before you left, I am TOTALLY jealous (and now wistful) thinking of Lucca! 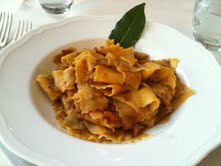 Glad your trip was great, and we, too, adore Locanda de Sesto – went for lunch. Went there a few years back and had some amazing organic wine. Rusticanella is always on our list of dinner favorites, as is Giglio. We need to meet in Lucca in November, when we’ll be there again. So sorry about the pictures, but the memories will be “in your head” for now….look forward to hearing more about your trip!!! OH MY GOD. That pizza. Looks jut fabulous. All those bright colours, and all those flavours. I love this! My favourite holiday destination has to be the greek islands, went once and it was unforgettable, but in terms of FOODIE destination, I would have to say somewhere closer to home in southeast asia. maybe thailand/china, or even just home, singapore! Faith, you HAVE to go to Italy. So many great markets, ingredients, restaurants, views and the people are fantastic. You would absolutely love it 😀 BUt I don’t like you calling it a bucket list. A to-do list if you please! STUNNING! This is my kind of recipe, absolutely lovely! 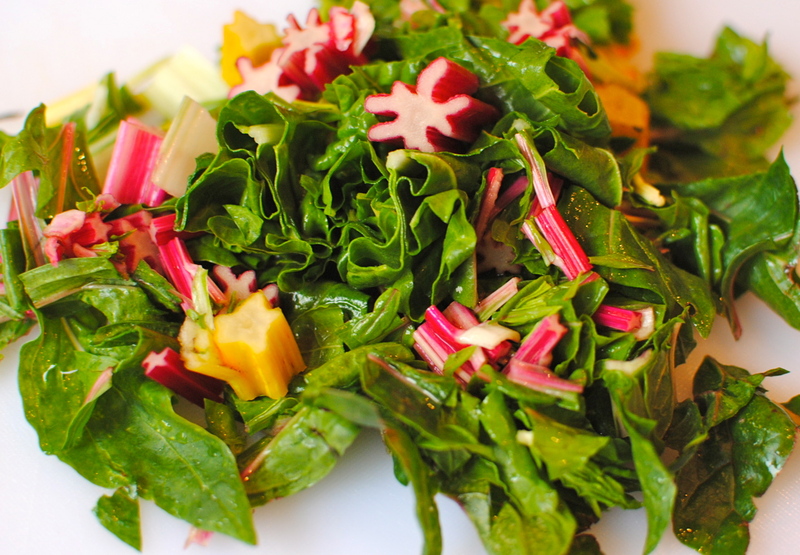 I adore chard too….